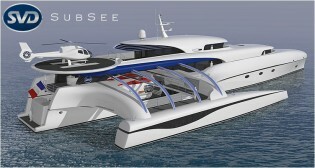 New 69m trimaran yacht Project SUBSEE under development at SVDesign – Superyachts News, Luxury Yachts, Charter & Yachts for Sale. The long travelling 69m mega yacht Project Subsee is especially dedicated to operate between 2 and 4 leisure submarines dependent on the size, and to lift them with a fully integrated lifting system. Trimaran configuration will provide a high cruising speed and a particularly long range compared to traditional superyachts. Propulsion set of luxury yacht Project Subsee is based on diesel-electric configuration, with gensets integrated into side hulls to provide a silent as well as comfortable cruise.